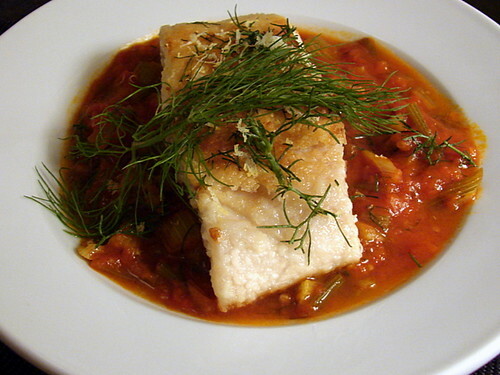 I spun out another one of our old standbys last night – crispy fillets of white fleshed fish (this time, black sea bass) over tomato-fennel broth. This is so easy to prepare, and I love how well it works in the heat of summer or on a chilly fall evening. Wine Pairing: Our friends at Thirst recommended the 2005 Olivier Savary Chablis Vieilles Vignes to go with this dish, and we both agreed it was a really gorgeous wine – a beautiful gold color, very crisp and flinty, with an almost toasted-buttery aroma. I really have to try this tomato-fennel broth sometime. It sounds delicious. Beautiful image, too — I love the dramatic lighting and complementary colors! I don’t think fish is served with tomato enough! Yay for your delicious take with this tomato-fennel broth. we were having a similar kind of meal, except that I had cod with a miso glaze, and made it under the broiler. I had a hard time judging when the fish was done, not sure I’ll use the broiler again. I like the way you cook yours – in the previous entry you mentioned using a cast iron pan – do you flip it over and add the fennel tomato broth to the same pan and finish it off on top of the stove? Or do something different? I would love to try it next time – love fennel, love tomato, think it will be heaven with a nice fish! Thanks, Sally! When I sear fish fillets for a dish like this, I usually season them on both sides with salt, give them a very light dusting of flour, shake off the excess and place them into the lightly oiled, very hot cast iron skillet skin side down. I let them cook most of the way (probably to 3/4 doneness) on that first side so the skin gets really crispy and so they are less likely to stick to the pan, then flip them and finish them on the flesh side. For this particular dish I cook the fish and tomato-fennel broth separately, then ladle the broth into shallow bowls and place the fish on top.